The 2011 Food & Wine Classic in Aspen, CO was held this past weekend, June 17-19. 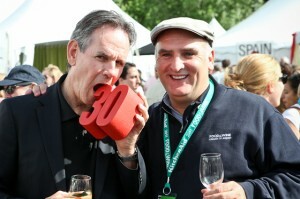 It was a special occasion for all who attended, especially since it marked Food & Wine's 30th anniversary celebration. Celebrity chefs Thomas Keller, Mario Batali, Michael Chiarello, and Lidia Bastianich were among the hundreds of celebrity and professional chefs present to share their talents with over 5,000 hungry attendees. French chef Jacques Pepin and Jose Andres were seen deep in conversation; Andres, of Minibar fame, explained to Pepin the proper techniques for preparing fresh Spanish green onions. At his tent, Andres served Gulf shrimp grilled over a heaping bed of sea salt. Chris Cosentino, host of Chefs Vs. City and former contestant on The Next Iron Chef, appeared wearing a T-shirt reading, "I Am Ruth Bourdain." It was intended as a satirical tribute, but speculators will likely deem it an interesting theory as to Ruth Bourdain's true identity. On the KitchenAid stage, Iron Chef's Michael Symon and Food & Wine editor Gail Simmons teamed up for a "Salty and Sweet" cooking demonstration. Ming Tsai also shared his expertise during "One Pot Meals," and Marcus Samuelsson hosted the "Belgian Beers and Seaside Classics" with Master Beer Sommelier Marc Stroobandt. Guests sampled authentic Hong Kong cuisine courtesy of the Michelin-starred executive and sous chefs at Langham Hotels and the Hong Kong Board of Tourism. Dishes included Moroccan Surf & Turf (snapper and lamb with garnish) prepared by Top Chef's Angelo Sosa, caviar over crab from Celebrity X Cruises, and jicama citrus salad presented by the Mexico Tourism Board. Top Chef: All Stars winner Richard Blais served a Saturday lunch of lobster and burrata rolls, roasted bone marrow topped with fresh clams, and tossed black garlic spaghetti with sea urchin, crab, and fennel sausages. And the ever-popular Top Chef Classic Quickfire live challenge took place on Sunday, pitting Kevin Sbraga and his sous chef Lee-Anne Wong against Richard Blais and his sous chef Hosea Rosenberg. Sbraga won the challenge, which was hosted by Sissy Biggers of Food Network's Ready... Set... Cook!